Whether you like to have an occasional drink, or you are a cocktail connoisseur, you have definitely used a shot glass before. Even if it’s cooking, shot glasses come in handy when you need to have a specific measure of a liquid. How Does a Shot Glass Work? Why Use a Shot Glass? Yet, sometimes it is hard to know which shot glass to use and how much liquid actually needs to be in there. This is exactly why, I sometimes ask myself, how many ml in a shot? I use both fluid ounces and ml, and you should too. Knowing how to use a shot glass is important when cooking and I will help you find out how to use it and make the best out of it. Bring out the shot glasses! You should know that the average shot glass varies according to the country, in the US, the sizes are as follows: larger is 3 ounces or 89 ml, the mid-sized and more common one, is 1.5 ounces or 44 ml, while a smaller one is 1 ounces or 30 ml. However, you should know that there is no standard size for a shot glass. The usual size is considered to be between 1.25 and 1.5 ounces. For starters, shot glasses are indispensable if you want to make a really good cocktail. Yet, shots can be used for several different things in cooking and preparing drinks. I find them particularly useful when trying to impress my guests with my baking skills, or when I want to have a fun party with my friends. In case you are wondering, shot glasses serve many purposes nowadays. Some people use them as wedding favors, as barware in parties, as board game pieces, and as gifts. The truth is, having a few shot glasses at home will never go unused, I suggest trying to use it when measuring things like oil, vinegar, water and even wine next time you cook. Usually, we think of shot glasses and immediately the image of a gross, rowdy college party comes to mind. There are ways, though, to make your shot glasses more appealing and classy. If for example you sip vodka out of a ice cold shot glass, or sip old-aged whiskey out of a taller shot glass, then you are by definition already using a shot glass in the way you should. Or maybe you decide to make a drink, like perhaps a gin and tonic, or maybe a Moscow mule, or perhaps even a Christmas cocktail for the holidays, then you are also using your shot glass like you should. 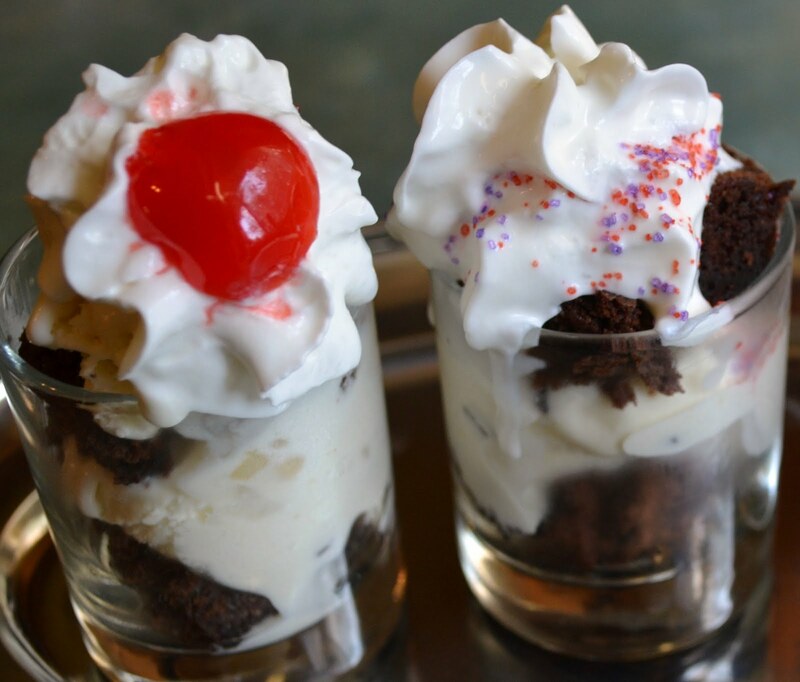 Yes, you can also introduce your shot glasses as part of you next dessert. I personally love the twist they add to traditional desserts. If you wanted to have your guests enjoy more than one dish at a time, shot glasses provide the perfect amount and allow you to serve more variety. In a plate, put your agave syrup or honey, and rim your shot glasses with it. Then add your crushed graham crackers to the rim. Combine your ice cream, strawberries and cake. Blend them until smooth. Fill up your glasses with mix and add whip cream to top. Place half of your brownie at the bottom of your large shot glass. Place your whip cream on a plastic bag, cut a bit at the corner and squeeze it into shot glass. Add your cherries, chop if they are too big, or mush them together to make a compote-like mix. Place the other half of the brownie. Top with whip cream and garnish with the coconut flakes. Heat ½ cup of the whip cream on a saucepan over medium heat until hot. Add the chopped white chocolate and then the peppermint extract. To cool, place in your freezer for about 10 minutes and whisk halfway through to make it thicker. Beat the other ½ cup of whip cream until thick. Add the chocolate mixture over it. Serve in shot glasses. Put them in your refrigerator and serve cold. Add peppermint candy pieces when ready to eat. Remember how many ml in a shot? There is no standard measure, but a regular sized shot in the US will probably be 44 ml. Shots can also be 89 ml or 30 ml. Now that you know exactly how many milliliters are in a shot glass, you can use them more often and save yourself some time measuring. What do you think? 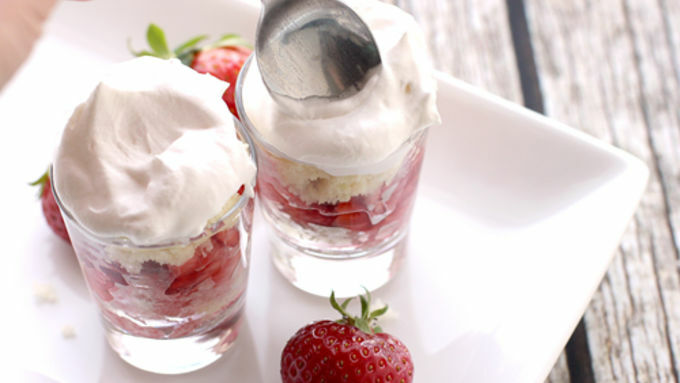 Have you ever made a dessert in a shot glass? Tell me what you think and if you use your shot glasses for any other purposes!